Wayne Osmond of the Osmond Brothers surrounded by Richard McFarlane and unnamed woman (probably Northern Chamber of Commerce Secretary). All three look at "Golden Spike Empire" book. 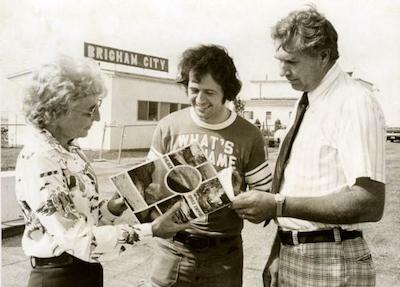 In background a building with Brigham City sign on top. Written on back, "Left to Right 1975 Visit of Osmond Brother / Northern C of C Sec. / Wayne Osmond, of Osmond Brothers / Richard MacFarlane Executive V.P. C of C / Welcomes Wayne to B. C + B. E. County to make film segment."